​The best way to lengthen the life of your snowboard and your gear is to protect it from damage, especially when not in use, and while travelling. 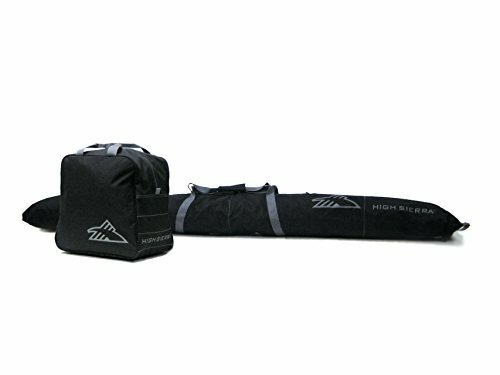 Getting the best snowboard bags not only protects your gear, but also makes it more convenient for you to transport your snowboard with all the gear you need. ​Anyone who is passionate about snowboarding will want to choose a bag that is capable of protecting their expensive equipment, yet also has enough flexibility so it is easy to use. The last thing anyone wants to deal with is a bag that’s cumbersome and difficult to handle. Most would really prefer not to deal with bags that make travel more difficult than it actually needs to be. For the most part, people are looking for something that is going to make their experience more pleasant, not the other way around. When it comes to choosing one of the best snowboard bags in the industry, you might want to consider purchasing the ​​Burton Space Sack. There are a lot of things that this particular product has going for it that products of a similar nature do not incorporate. Perhaps most importantly, the bag features a shoulder strap that is removable, leaving it up to you to decide how best to use it. This is an imported bag that is constructed completely from polyester; it is relatively easy to maintain and keep clean, even when it has been subjected to the elements. The bag also allows you to transport more than one board at a time, while still providing an excellent level of protection. Use caution when inserting or removing boards to prevent the bag from being cut or torn. Extra padding can also be added to the bag if required. If you are in the market for a well-designed bag that is capable of standing up to the demands of most snowboarders, this is definitely a product that you should consider purchasing. It can handle most of the demands that are thrown at it with relative ease, making it easier for you to transport your boards without damaging them in the process. 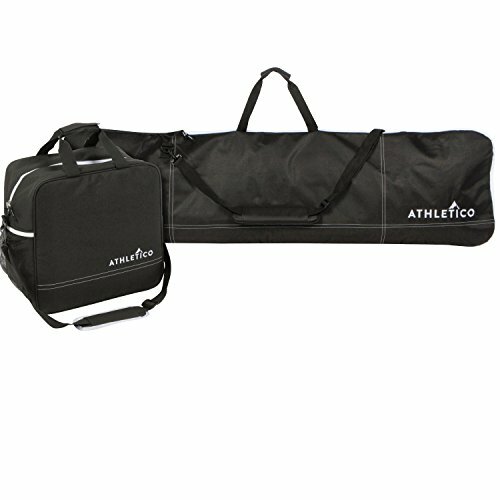 The Athletico Two-Piece Snowboard and Boot Bag Combo separates your snowboard from your gear and your other things to make it easier to carry, as compared to a bulky large bag. The boot bag is specious enough, not only for the boots, but other gear and a few items of clothing as well. The snowboard bag is actually a sleeve that isn’t padded, but is just meant to help you carry your board easily and place it in your vehicle. Using it on flights is very risky for your board, so don’t do it if you don’t want your snowboard to get damaged. 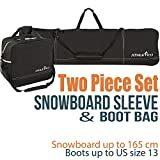 The snowboard sleeve is capable of fitting snowboards that are up to 165 cm and the boot bag can fit up to size 13 boots, plus some of your other gear. Although it is not padded, it provides an affordable and more convenient way to better transport your snowboard instead of simply placing your bare snowboard in the car. The bags come in black fabric with white zippers as accent and their logo embroidered on the side. 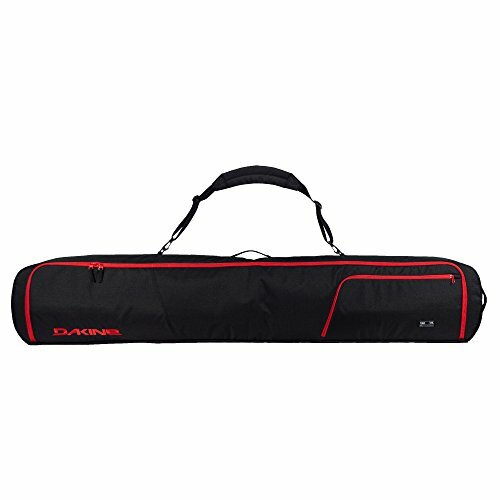 The ​Dakine Tour Snowboard Bag is available in various sizes, 157cm, 165cm and 175cm, to snugly fit your snowboard, even with bindings attached. It is fully padded to ensure protection for your board, especially when you plan to travel with it by plane. There are pockets specifically designated for boots, which can also be used to store other items of gear. It can only be carried through the removable shoulder strap and handle. It would have been better if it had wheels. However, carrying it by the handle or strap isn’t an issue. It can be fully opened to easily remove the snowboard and its other contents. With lockable zippers, added security is provided to the precious snowboard and gear. It can be carried by using the handle or the removable shoulder strap. Every snowboarder dreams of a perfect equipment bag that allows them to safely and securely transport their snowboard and other equipment without worrying about anything becoming scratched, dinged, or otherwise damaged. The ​High Sierra Ski Bag & Boot Bag Combo is a product that many have chosen because it is capable of delivering the performance that is required. One of the first things you will notice about this particular combo is that it looks different from almost everything else that is available on the market. It looks different because it is made differently, thereby allowing it to perform in a category that is almost by itself. If you really want to know whether or not this particular product is for you, keep reading about the advantages and the potential disadvantages that are associated with owning and using it. You will probably notice the first time you lay eyes on this bag that is a lot longer than many other snowboard or ski bags that are available. It was designed to fit some of the longest skis that are made, but it also features a unique design that allows you to fold it down to the size that you need; this gives you the opportunity to create something of a custom design without having to purchase different products of various sizes. It also features a durable construction; it is capable of taking quite a lot of punishment and still protecting the items inside. Below is a list of some of the advantages that are typically associated with owning this particular combo. The zippers are extremely durable and easy to use. There are sometimes issues with the zippers if they are forced. If you do have issues and it jams, try zipping it slowly. ​This is a well-constructed product that is very different in both its design and its overall performance. If you are in the market for a combo, this just might be the one for you. It is definitely worth investigating further. The ​Dakine Low Roller Snowboard Bag is a mid-size snowboard bag that can fit your snowboard, boots, bindings, gears and other winter clothes for your weekend getaway. There is no shoulder strap so you can only hand carry it, or pull it using the wheels. This can be quite inconvenient, especially when you go are going up or down the stairs. You can have handles sewn on at a later stage though. ​The fully padded bag with wheels makes it a very airport-friendly bag that you can take with you on your travels to reach new snowboarding destinations. It comes in two different colors and various sizes to fit your personal taste and the size of your snowboard. When selecting a snowboard to purchase, first think about where you go to snowboard. Do you have a local area where you can enjoy the sport, or do you have to travel by plane to get there? This will help you determine if you need a fully padded snowboard bag or not. Fully padded snowboard bags offer more protection, but they can be more expensive than just the sleeves. Sleeve-type snowboard bag will do when you just travel locally. Padded bags are a better choice when you travel with your snowboard by plane. Take note about the size of your board and the bag. A bag that is very big may seem great because you can put a lot of things in it, but that would also mean it will be heavy. Find the right size for your snowboard and just pack the basics. You won’t need too many clothes if you plan to spend most of your time snowboarding. Look closely at how the bags can be carried. Some have a shoulder strap, others have a handle and wheels, while some have all of these features. This is quite a personal choice, but wheeled bags are more convenient at the airport. Special compartments for your snowboard boots are great because you can separate them, especially when they are dirty. It is also easier to organize when there are compartments that you can use. It’s a great added bonus to a snowboard bag. 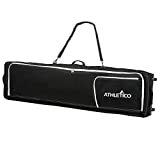 When selecting a snowboard bag, it is important to consider what you want to use it for. If you just need a more protected and convenient way to carry your snowboard and some gear, a sleeve type, such as the ​​​Burton Space Sack will do. 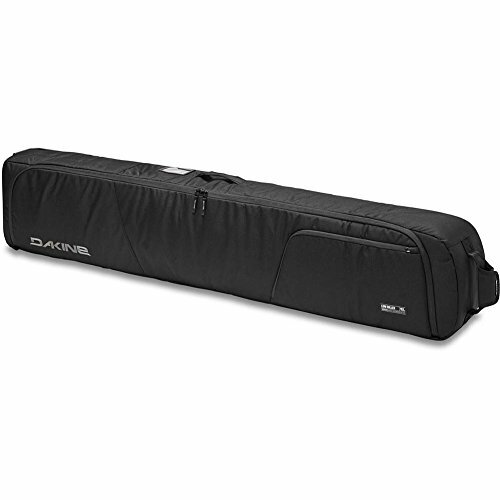 On the other hand, if you tend to travel by plane with your snowboard, then the fully padded ​​Dakine Low Roller Snowboard Bag is best for you. The wheels make it convenient to tow with you around the airport and it has enough padding to prevent your snowboard from being damaged due to how baggage is handled in an airport.